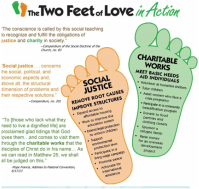 The Works of Mercy Initiative, works to increase understanding and awareness of the Church’s teachings on social justice issues, and to encourage participation in actions to address those issues in the Schenectady community and the community at large. Pope Francis commented “Christians are good at praying but hungry people can’t eat prayers.” There is an old saying that goes “It's not enough to pull drowning people out of a raging stream; we must walk back upstream, and see who is throwing them in the first place!” Today, 47 million of our brothers & sisters in the U.S. & well over a billion members of our human family around the globe are “drowning” in the raging stream of hunger & food insecurity. While we are good at responding with prayers & alms giving (certainly both are needed), Christ calls us to go a step further & to open ourselves to greater action. He call us to “walk back upstream” & seek the underlying causes of hunger & food insecurity. Then he call us to change – first – ourselves individually, & than our parish, our communities, our country, & our world so that we can dig up and eradicate the root causes of hunger & food insecurity. Join us by contacting worksofmercyschdy@live.com.